Needless to say, the last few weeks have been a blur. Not only did Leon and I buy a condo in northern Virginia, but we also planned a wedding and got married–while both working full time. I will never take coffee for granted again. Before we knew it, June 2 arrived and we were standing up in front of family, friends, and God in our church, Columbia Baptist, in Falls Church, Virginia. The ceremony itself was beautiful, and things went smoothly. It was a relief when the logistics all played out well, especially because the evening before our wedding day there were major storms in the D.C. area which left dozens of guests stranded in airports around the country. Thankfully, everyone arrived safely (some guests took a taxi straight from the airport to the ceremony) and the wedding proceeded without a hiccup. Then, before we knew it, we were off to the airport to catch the first flight of our honeymoon trip. It wasn’t just a honeymoon trip for me, however–it was the fulfillment of a 10-year dream. We were headed to Bora Bora. Back in college, I first saw a picture of Bora Bora and became intrigued by the overwater bungalows, emerald landscapes, and turquoise waters of French Polynesia. My goal was to get there someday, hopefully for a honeymoon, on account of the island having the reputation for being one of the most romantic destinations in the world. I had mentioned to Leon while were were dating that I hoped to go there one day, so it was surreal when we were actually headed there as a newly married couple. My new husband and I were braced for a challenging travel itinerary–three flights and a boat–but were beyond ecstatic. As we landed on Bora Bora and took a boat out to the Pearl Beach Resort (known as a private, traditionally Polynesian establishment), I pinched myself for about the fifth time. 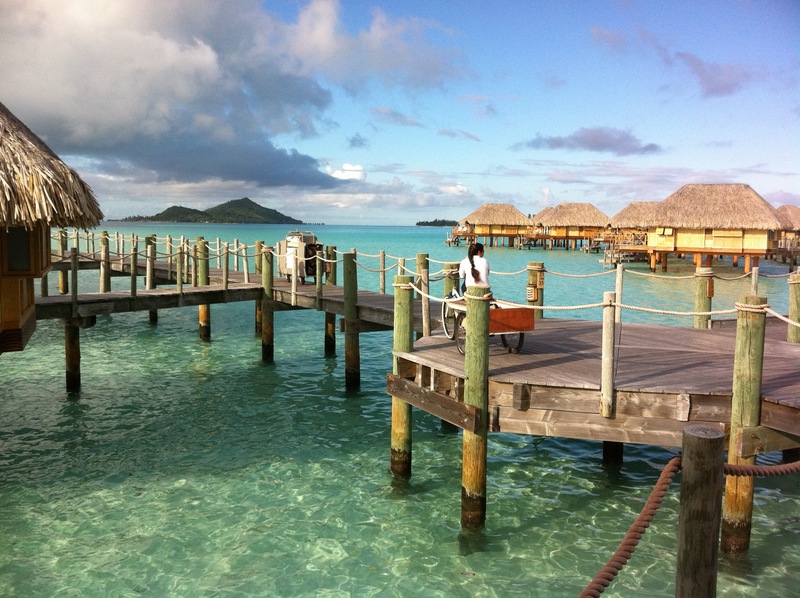 Photos of Bora Bora, as beautiful as they are, simply do not do the island justice. To say that the tempo of life on Bora Bora was a far cry from the rigorous pace of D.C. would be an understatement. We spent a week and a half indulging in island life, and it was incredible. From the time we arrived, my husband and I turned off our iPhones and dove wholeheartedly into the rhythm of the South Pacific. The islanders went to bed at sundown, and so did we. Locals woke up with the sun, and so did we. They walked around with giant baguettes in their hands, as did we. It was fascinating to see the fusion of Polynesian and French culture at play in the historically French territory, mixing the French love of good cuisine with the laid-back mentality of Polynesian tradition. We spent our days diving off of our overwater bungalow deck into the crisp South Pacific, having coffee each morning while watching the sunrise, feeding the fish from our glass bottom coffee table, and strolling around the island after having giant plates of French/Polynesian food each day (fresh seafood paired with rich French sauces and crusty bread? Yes please). Food was a large part of our honeymoon experience on Bora Bora, and I discovered a new appreciation for vanilla–namely, Tahitian vanilla. As I write, I’m craving a large mahi mahi fillet with Tahitian vanilla sauce, followed by a Tahitian vanilla creme brûlée for dessert. Speaking of good food, going to Bloody Mary’s for dinner when you visit Bora Bora is also a must. We took the boat over to the main island a few evenings to catch the restaurant’s shuttle, when we were then greeted by the sight of fresh mahi mahi, oahu, parrot fish, marlin, and other delicious fish which were caught and then put on ice for you to choose from. As I mentioned before, my favorite dish while on the island was definitely the fresh mahi mahi with Tahitian vanilla sauce. There is nothing quite like it. We also spent a few lazy island afternoons meandering through the artisan market and shops of Vaitape, the local village on the main island of Bora Bora. The locals were incredibly friendly, constantly greeting foreigners with “Ia Orana” in a tone that was genuinely affable and warm. It also felt good to dust off my long-neglected French and try to get in some good language practice, whether with the local islanders or French expatriates. A Bora Bora vacation can be as simple or as extravagant as you’d like for it to be. In our case, we chose to simply relax and enjoy the island at a slow, uninhibited pace. I was thankful to have the chance to fulfill my dream of visiting the island, and even more thankful to visit it at the beginning of an exciting new chapter of life. With its unparalleled beauty, laid-back nature, and blend of cultures, Bora Bora is truly unlike any other place on earth.